I first learned about Banff three years ago. I remember looking up photos and being in awe of how beautiful it was! I decided then that I had to visit! Fast forward to now, I finally made the trip happen! 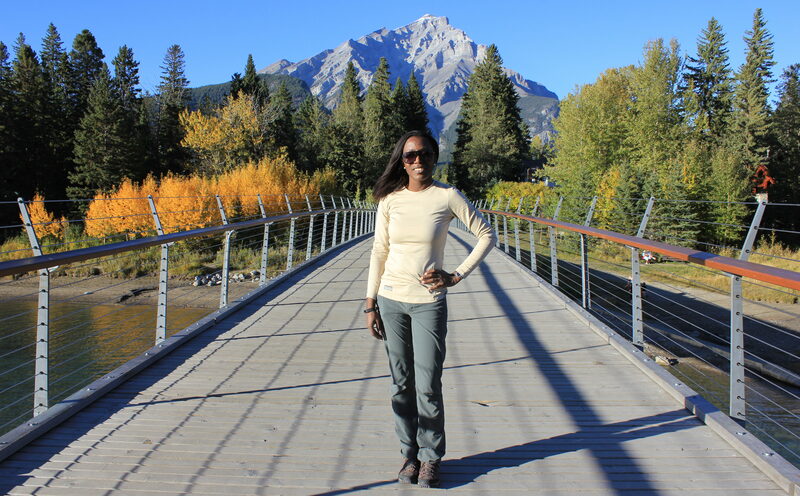 Banff is magical and reminds me how beautiful nature is – from the jagged and majestic Rocky mountain peaks to the turquoise-colored glacier-fed lakes. It is calming, inspiring and restorative. When you’re in the middle of somewhere so grand, you realize how small you and your problems are. It puts all of life into perspective. I love soaking up experiences like this! This trip was particularly special because I intended to do it solo. I wanted to be on my own time, do things I wanted to do, travel how I like to and have the space to digest the experience. 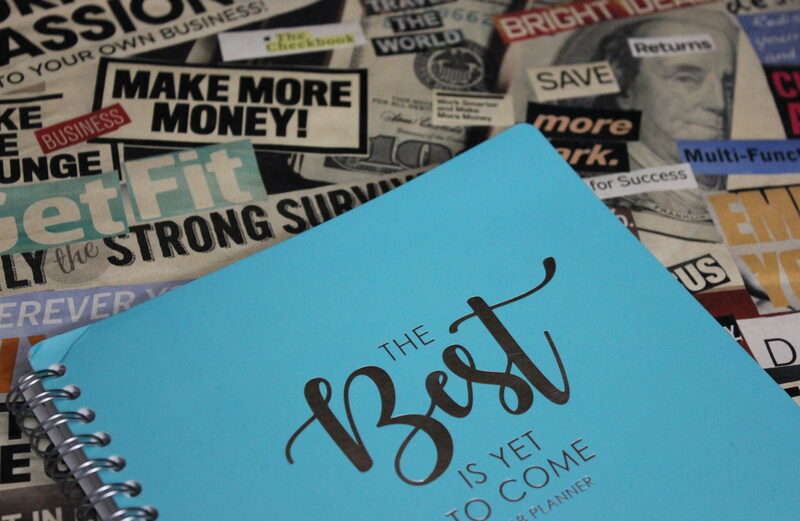 It was a personal lesson and reminder for myself – there’s nothing restraining me from doing or pursuing the things I want. When time, resources, access, etc. aren’t a roadblock then what’s left? The only thing left is me. Do I want to invest in myself and my experiences or not? There is only one option for me. 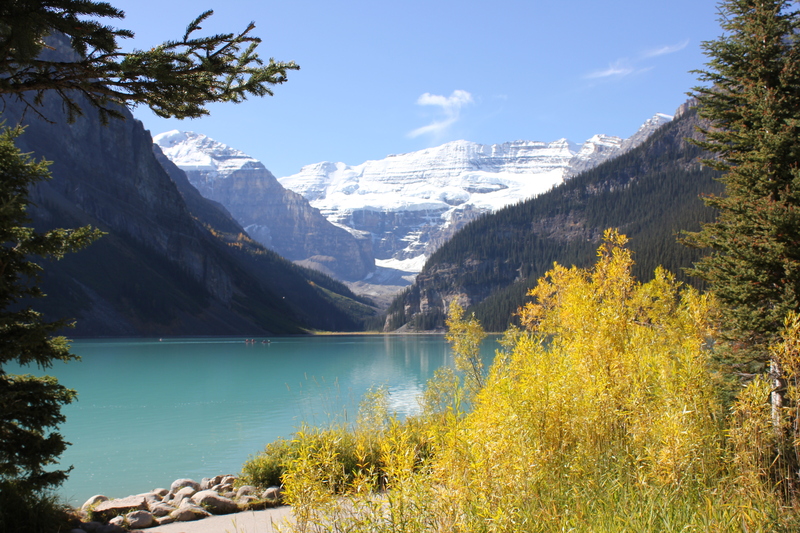 Before heading to Banff, I did some research and created a list of things I wanted to see and do. I like to keep my travel plans flexible and so the idea wasn’t to schedule out the entire time. Instead, I wanted to lay out my options so I could be proactive about logistical considerations. As it turned out, the effort was well worth it and came in handy when I ran into other solo travelers from Germany (Sibylle), Australia (Tim) and Jasper (Alysha), which is a few hours from Banff. We decided to explore some of the attractions together and my list was a hit! We ended the first day in full agreement that it was one of the best (travel) days of our lives! Here is what was covered in two days in Banff. This doesn’t include everything on my original list so I guess I’ll have to go back another time to finish it off! Calgary (YYC) is the closest airport to Banff. I had a connecting flight through Minneapolis (MSP) and arrived in Calgary around 10 PM. I stayed at an AirBnB that night and woke up early the next morning to catch a 7:30 bus to Banff. 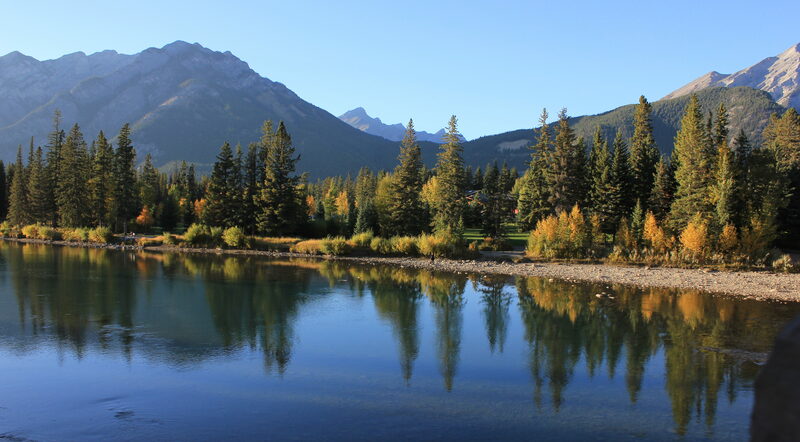 It is a quick drive with great views of the Rocky mountains along the way. Everyone on the bus was excited and the cameras and phones came out to take pictures! I arrived in Banff around 9:15. When your camera is having a slow start to the day but your phone is ready! #samsungs7edge Good morning world!! I headed to the information booth at the Railway / Greyhound Bus Station once in Banff to figure out how to get to the Banff International Hostel. I got one of the great maps they had of the town with key landmarks (you can find it here). As I followed the directions, I took in the scenery along the cool, early morning walk. I packed light with my main backpack and a hiking backpack for running around during the day. Check-in wasn’t until 3 PM so I left my backpack for the day and got some directions from the front desk before heading out. The first stop was to exchange currency at the Clock Tower Mall but I ended up going to the Money Mart on Banff Ave. instead. Next, I grabbed some coffee and a parfait before rushing back to the Railway / Greyhound Bus Station to catch the 11 AM bus to Lake Louise. Since Canada is celebrating 150 years, all the national parks are free this year and free shuttles were being provided to certain destinations around Banff including Lake Louise. A win-win for Canada and visitors! I made it to the shuttle just before 11 and got situated for the 45-minute ride to Lake Louise. Along the ride were more amazing mountain views and trying to capture pictures on both sides of the bus got everyone talking. This is when I met Tim from Australia and Sibylle from Germany. Tim and I hopped off the bus, realizing we had no solid plan for the day and decided to create our own adventure! We ran into Sibylle again by the lake and the rest is history! We were especially lucky to have clear blue skies and temperature in the mid-60s, a rarity in the final week of September! But the timing was perfect because it is just after peak season and before it was too cold. 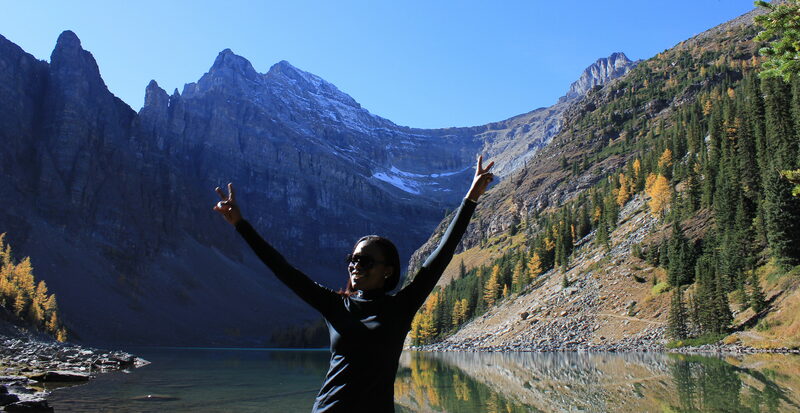 I was so excited to walk up to Lake Louise after three years of anticipation! The lake was more beautiful than I could have imagined! Before taking any pictures, I just stared and took in the scene. Then, of course, the snapping began! Next, we hiked to the Lake Agnes Tea House. We quickly noticed and felt the elevation gain and reduction in oxygen! It was steep and made us short of breath. The hike from Lake Louise is 2.2 miles each way with an elevation gain of 1312 ft. to arrive at an altitude of 7005 ft.
We passed a waterfall and Mirror Lake along the way. We arrived to the Lake Agnes Tea House which sits right next to Lake Agnes. The Lake Agnes Tea House was built by the Canadian Pacific Railway in 1901 as a refuge for hikers. It has no electricity or running water. The staff bring all fresh food up the trail daily. We relaxed by the tea house and had a snack before heading back. We debated hiking up to Beehive but decided to try to get to Moraine Lake instead. Visitors are invited to help the Tea House staff carry waste down so on the way back, Tim helped out with carrying a bag. This part of the hike was so much easier! We encouraged hikers coming up, remembering what it was like to be in their shoes! We also stopped to take some photos, including Lake Louise from above to capture the amazing turquoise color of the water! By the time we made it back, we had missed the last shuttle to Moraine Lake which left at 4 PM. I was really disappointed. We got on the shuttle to head back into town and headed back to our hostels for a while before walking around town. We visited the All in the Wild Gallery where the sales associate told us about the aurora forecast. She said she had never seen it as high and there was a really good chance we could see the Northern Lights! We added this to the list for after dinner! We had dinner at Athena Pizza and Spaghetti House. After a long day of hiking, it was great to sit, eat and drink water. We were especially dehydrated from the elevation gain. After dinner, we headed to find a spot to watch the Northern Lights. 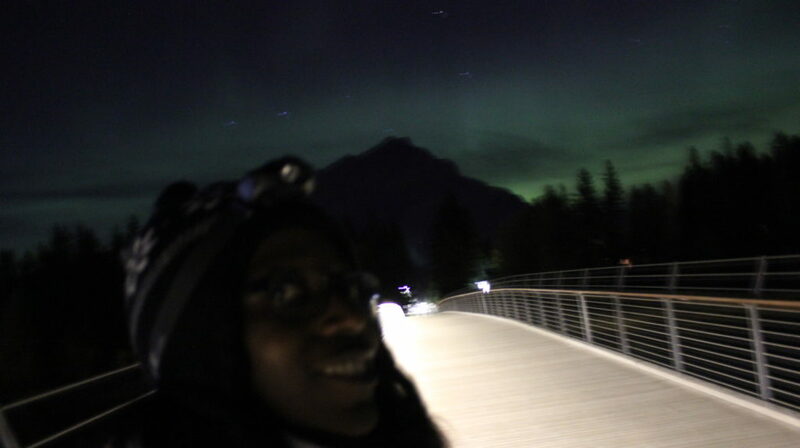 We started on the pedestrian bridge over the Bow River then ventured across town to find somewhere with less lights. We were heading out of town but found ourselves surrounded by trees and without the elevation we needed. So we decided to head back into town, and made an obligatory stop by the Welcome to Banff Sign. After hanging out at a local bar to warm up a bit and pass the time, we headed back the Bow River bridge. We heard the best time to see the Northern Lights is between 1 and 3 AM but learned there was a good show while we were at the bar! We waited a while and eventually the lights started dancing across the sky again! It was so awesome to see! There were beams and what looked like clouds spreading across the sky before disappearing. We also saw shooting stars! We were all so thrilled! This was a great surprise and way to close out the already amazing, serendipitous day we had! This is why we rated this day high on the list of the best days of our lives! After being up late watching the Northern Lights, we were a little sluggish getting the day started. We caught the 10:38 Route 1 bus ($2 each way or $5 day pass) to the Banff Gondola (you can get tickets in advance here at a discount). The gondola took us up to the peak of Sulphur Mountain for a view of Banff and the Rocky mountains. The ride up is approximately 8 minutes and isn’t for those who are afraid of heights! But it brought amazing views as ascended the mountain to the 7,486-foot summit! 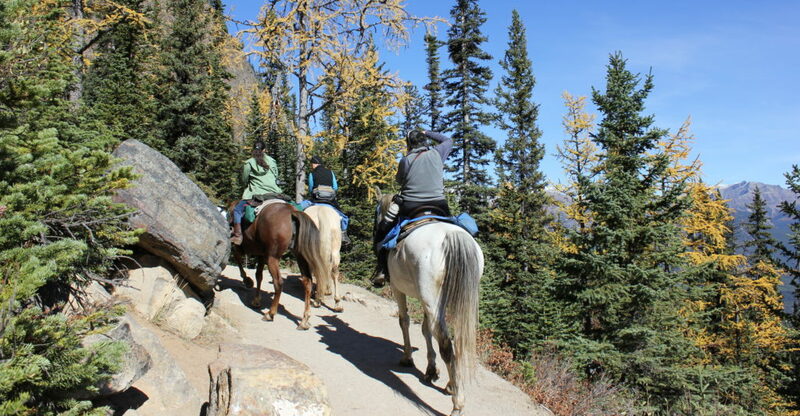 There is also an option to hike the Sulphur Mountain Trail to the top. At the top, we walked around the Sulphur Mountain Boardwalk which takes you from the upper gondola terminal to the summit of Sanson Peak, where there is a stone weather observatory built in 1903. All along the 0.4-mile long boardwalk, you get amazing views of the surrounding mountains and a 360-degree panoramic view from Sanson Peak. Mountain peaks were in every direction! Once we got back to the upper gondola terminal, we browsed the interactive exhibits, the multisensory theater and gift shop. Then we caught the gondola to head back to the valley floor. Next, we got on the Route 1 bus to the Banff Upper Hot Springs. This stop didn’t disappoint, especially after hiking the previous day and walking around the Sulphur Mountain boardwalk. The hot springs pool is outdoor with 100% natural mineral water. Its elevation is 5,200 feet, which makes it the highest in Canada, and it provides mountain views while you soak in the sun. The water was very warm so I had to take some breaks and sit out a few times. We headed back in town after and saw Tim off to Calgary. Sibylle and I walked around town, got some ice cream, and checked out souvenir shops. We went back to the All in the Wild Gallery and were happy to tell the sales associate that we saw the Northern Lights thanks to her suggestion! We then walked along the Bow River at the edge of town and came upon Bow Falls. I enjoyed the scenery, especially the fall colors against the bright blue backdrop of the sky. We eventually made our way back into town, had dinner at Indian Curry House and then Sibylle was off to Vancouver. I made a quick stop at one of the grocery stores in town then headed back to my hostel. I took a quick nap then packed before settling in for the night. I was up early to check out of the hostel and get on the bus to Calgary. 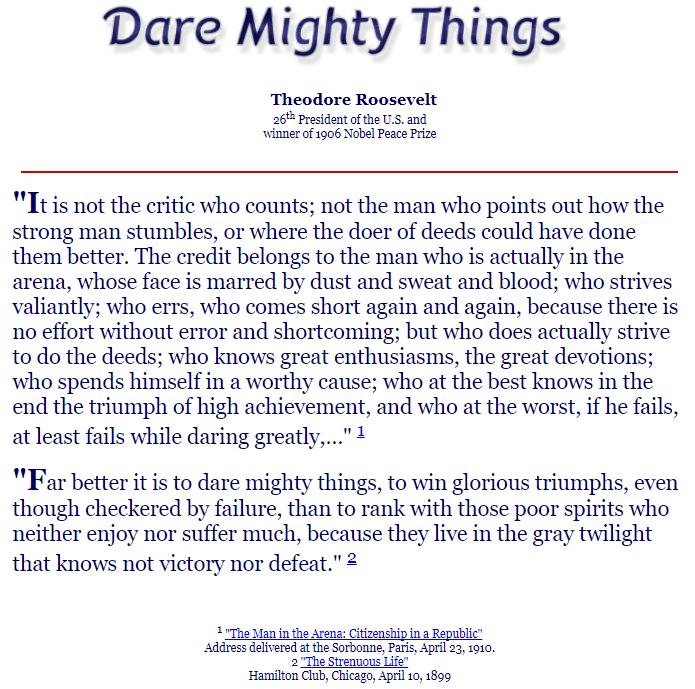 I reflected on the past couple of days while taking in the mountainous scenery along the drive one last time. Once I arrived in Calgary, I took the train into downtown then walked around a bit. I found a coffee shop and stopped for some coffee and used the Wi-Fi to request an Uber to the airport. I thought I would have more time to explore Calgary but the time was tight. So Calgary will have to be for a separate trip or Banff Part 2! 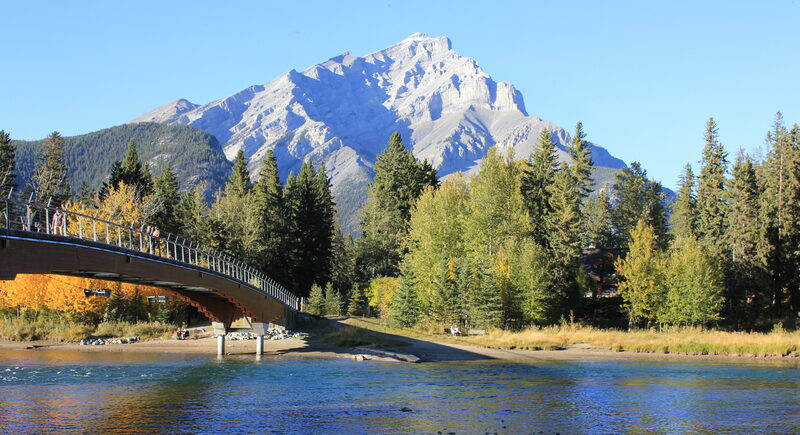 I am so happy I committed the time to visit Banff! 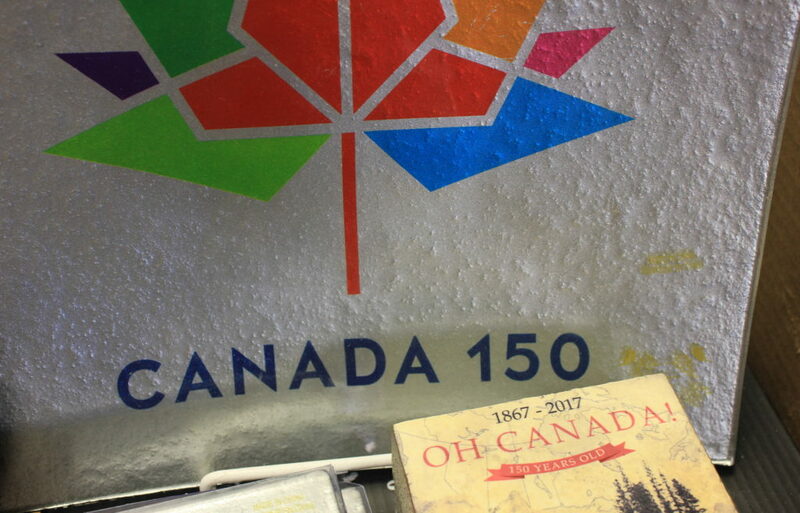 Everything worked out well including the benefits that came along with Canada celebrating 150 year, making new friends to share this awesome experience with and the wonderful weather we enjoyed!